Do you need to transport people with equipment or supplies? No problem. Our Pack Mule® and Power Mule™ carriers safely and efficiently move both people and materials. These green-friendly electric vehicles are perfect for factories, warehouses, distribution centers and sports arenas. Our single and multi-passenger vehicles are suitable for most applications, and zero emissions make them safe for people and the environment. Made of 14-gauge diamond plate steel, the personnel carrier utility vehicles are meticulously engineered for durability, safety, easy operation and minimal maintenance in tough, demanding environments. Available in 1, 2 and 4-passenger models, these carriers are equipped with a single accelerator / brake pedal, which makes them safe and easy to operate. The fully integrated Performance Plus Direct Drive System is completely sealed, which means it's dirt/water resistant and tamper-proof for maximum reliability and reduced maintenance. The separately excited motor, Dana Spicer transaxle and Sevcon motor controller provide unsurpassed performance, efficiency and reliability. 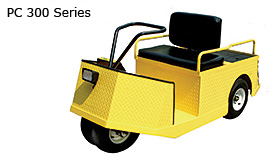 Features include programmable speed control, programmable regenerative braking, programmable maintenance management system, on-board battery charger with an automatic shut-off, and no replaceable forward/reverse contactors-all designed to give you years of reliable, cost-effective service.